608 pages, over 1,400 illustrations, 14 colour plates. Heavy duty colour plastic laminated dust jacket. This is the new enlarged and updated edition of previous “The Lee Enfield Story”, out of print since a long time. The nett product of more than four decades of international research and study, the new "Lee-Enfield" has evolved through two prior editions and many other related titles. Surely the ultimate account of a century’s development and issue of the Lee-Enfield rifle. L42A1 sniper rifle serving in modern conflicts, the Lee has proven itself as the finest battle rifle of all time. No other longarm has served for so many years, in theatres at home and abroad, with such a proud record of service. 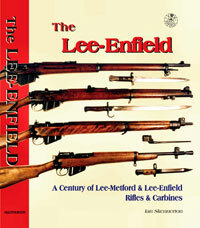 This book encompasses all aspects of Lee-Enfield development and productions in Britain, America, India, Australasia, South Africa and the Far East. The rifles, carbines, bayonets, component parts, tools, accessories and ammunition are arranged into specific groups and chapters. along with 14 pages of colour plates. No proper reference is complete without a comprehensive index; this too has been expanded from the previous editions. With such a broad field of models and variations, a new initial chapter enables newcomers to identify items by their features and markings. This final edition comprises of 608 pages in full A4 size format, printed on matt art paper. Ribbon markers are red, white & blue and the dustjacket is heavy duty plastic laminated, designed for serious users. This is over 10% larger than the previous edition, considerably bigger and better with quite a lot of new information. The book weighs nearly 2.5kg. The Pattern Room collection and library has been the primary source for samples and records. With more than 1,400 illustrations in a larger format, this presentation sets a new standard for collectors, students and shooters of the venerable Lee-Enfield.